For any advanced learning experience to be effective, it must provide a blended mix of quality content, materials, and group interaction as well as enough unencumbered time to allow participants to reflect and introspect. This course is crafted to do just that. 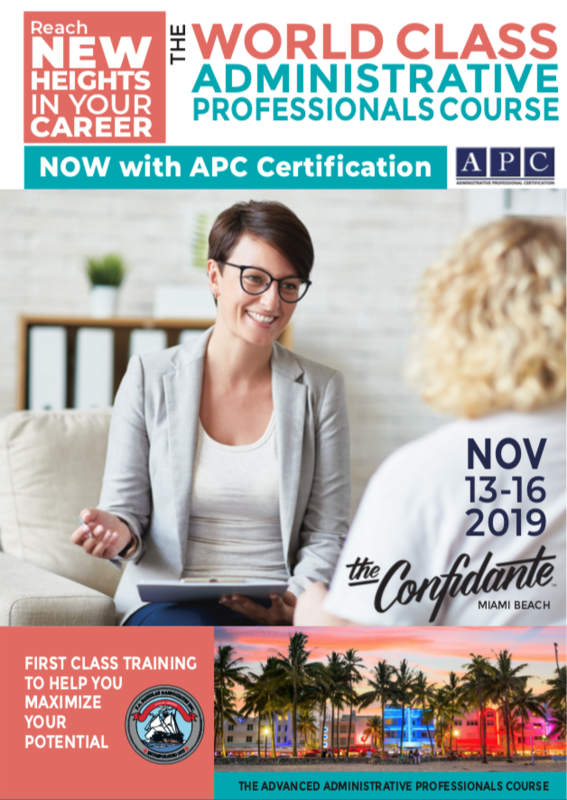 The World-Class Administrative Professionals APC Certification Course is a three-day program designed to advance the participant’s competency in the six vital areas of concentration outlined in this brochure. P.A. Douglas is well suited to present this course. For over forty-ﬁve years, we have set the gold standard for excellence in AA and EA training. 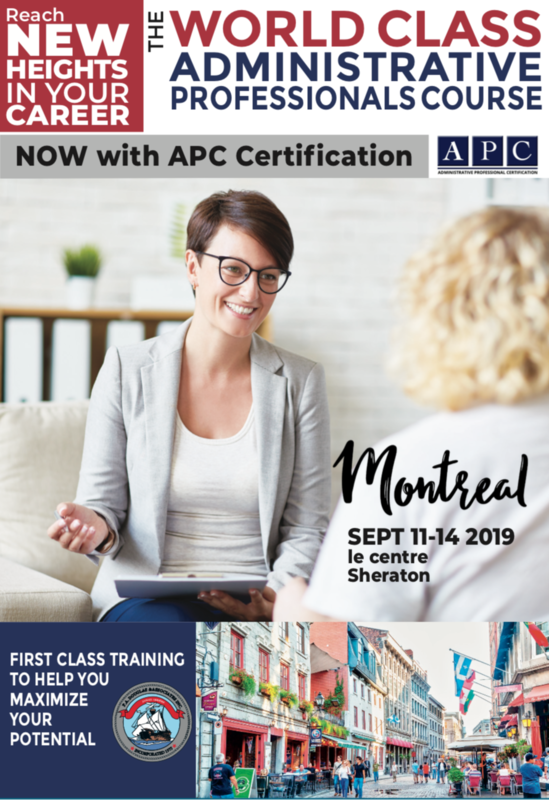 No other seminar or event provides the comprehensive high-quality advanced program that the World-Class Administrative Professionals APC Certification Course does. You will return to your job energized, motivated, refreshed and renewed, armed with a greater ability to face the ever-changing demands of your profession. The World-Class Administrative Professionals Course is our most senior program. This highly-targeted course will afford you the opportunity to set realistic expectations, better partner with your boss, influence and motivate other team members and develop your emotional intelligence, communication and decision-making skills. Management increasingly relies on you to organize the office, solve problems and project an appropriate professional image. At this advanced course, you will expand your emotional intelligence and learn how to communicate directly, but with greater discretion and diplomacy. You will develop winning strategies for dealing with different and sometimes difficult people. You will significantly enhance your ability to exert influence and plan and organize projects successfully. 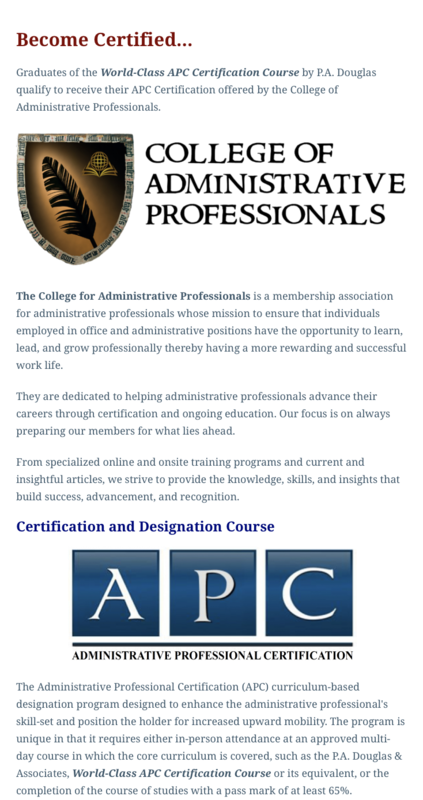 Most importantly, you will develop the essential skills and best practices of a world-class administrative professional - developing a stronger professional reputation and greater visibility, increasing your value to your organization and enriching your life. The residential nature of this seminar provides many opportunities to engage in valuable interchange informally and affords the participant a unique opportunity to consider the focal topics in much greater depth than is possible at a one or two-day "hometown" seminar. MIAMI is the continental United States’ southernmost city and the principal city of South Florida, a culturally distinct region with close ties to Latin America and the Caribbean. Miami Beach is known for its beaches, glamorous nightspots and celebrity-chef eateries, indie fashion shops, and shopping malls the South Beach neighborhood of Miami beach fairly glitters with nightlife - all day long. It is trendy and quirky and - hey, watch out for that guy on roller skates - just a fun place to be. Yes, South Beach attracts the rich and famous and youthful, but it now is recognized around the world as an exciting destination for everyone. Enjoy the beach or South Beach’s historic Art Deco architecture or the fine oceanside dining. Watch live music every night at Bayside Marketplace or check out the Wynwood’s murals on your bike. And don’t miss ‘Little Havana’ a vibrant main drag of traditional eateries, stall vendors, and street performers, Little Havana is the heart of Miami’s huge Cuban expat community. Miami Beach’s South Beach - you have to experience it for yourself. Make the Case to Attend! Download PowerPoint Presentation and Letter to Convince Your Boss!